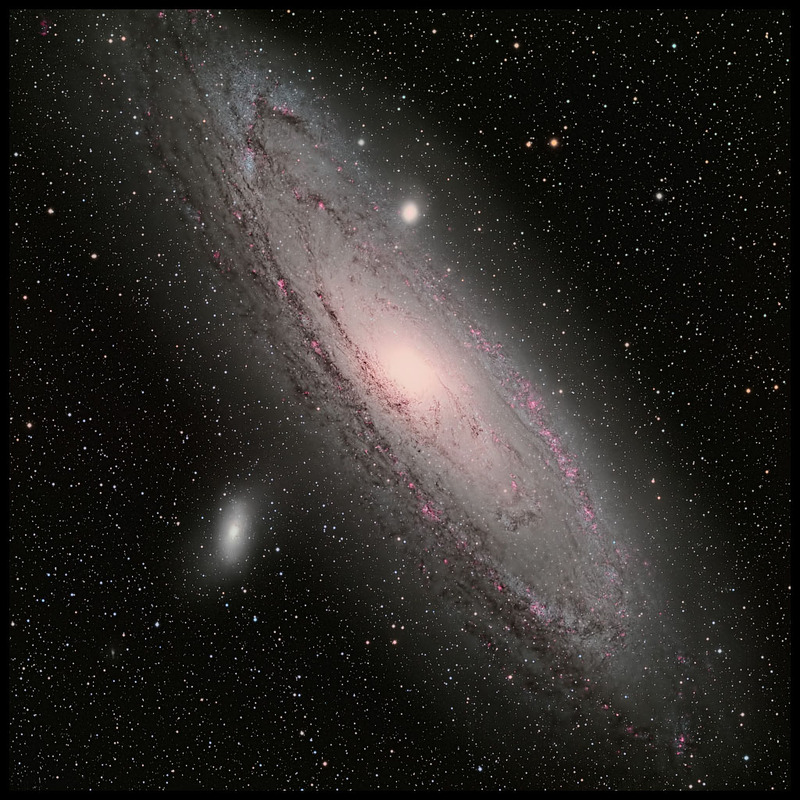 Hi folks,Thought I'd share last week's first attempt at imaging M31: 'Scope: TEC 140 Mount: ASA DDM60 Pro mount - an awesome bit of kit as even the 1,500 second subs were unguided! Camera: FLI ML16803 Subs: 5 x 1,000 seconds using each of Astrodon Tru-Balance RGB filters plus 10 x 1,500 seconds using an Astrodon 3nm H? filter Software: PixInsight and Photoshop CS6Having been an inactive member for around 45 years I thought it about time I contributed something, even if it has all been seen before! I optimised this 1024 x 1024 pixel version for web viewing from a normal distance (not pixel peeping). The larger 2048 x 2048 pixel version (here) is much less aggressively processed.Bob. Bob,That is a spectacular image and just shows what can be done with modern equipment and hard work. I'm certainly impressed by the tracking capabilities of the mount! Direct Drive mounts certainly seem to be the way to go. I'd be interested in any comments that you have on them. I had heard that the mechanics of the AS DDM mounts were very good but that the control software left a bit to be desired. Nick. Hi Nick,Thanks for the kind words. I'm not sure that I'm best placed to give a detailed comparison as the ASA DDM60 Pro is my first grown up mount, previously only having owned a cheap and cheerful motorised equatorial. Mechanically, as you have read, the ASA mount is an absolute delight and is just light enough that I can manoeuvre it on and off the pier:[img size=854]http://andersson-design.s3.amazonaws.com/astro/TEC/Sequence.jpg[/img]As I understand it, earlier versions of the control software needed a deal of manual fine tuning of the three parameters used to control the motor power and responsiveness but that situation is much improved now. Even so I did have to tweak one setting a little after the automatic calibration routine (the software wobbles the mounting separately on the two axes in order to sense the moment of inertia of whatever is attached) as I was hearing some noise as the mounting slewed - it is normally completely silent! The manual gave me enough extra information to do this quite easily.When first installed the mounting allows a rough polar alignment in the northern hemisphere via use of a built in laser. That was good enough for me to mark out and drill the last few holes for the bolts which tie the mounting to the top stainless steel disk. The two stainless steel disks that you can see in the picture above and which couple the mount to the pier were bought separately from a laser cutting firm in the UK and had all the holes for the M12 bolts which hold the bottom plate to the pier and tie the two plates together accurately cut. The next task was to use the supplied Autoslew software to fine tune polar alignment. This is an iterative process where one commands Autoslew (I used third party planetarium software to do this) to point at a star and then nudge the pointing via Autoslew's software control until the star is centred (using cross-hairs or, better still, a camera for pixel perfection) and then tell the software it is centred. Do this for three stars and then tell the software to do some sums. Then tell the software to point at the first star (should be near the meridian at about 45° elevation and apply it's calculated polar alignment error. Then it's a matter of adjusting the mounting screws to mechanically recentre the star. This procedure is repeated a few times until alignment is complete. With practice this could be done on the road with a tripod but I haven't tried it.There is one further critical step for long exposure unguided astrophotography and that is to train the software to compensate for any residual pointing errors due to polar alignment (obviously can't compensate for field rotation! ), mechanical flexure or atmospheric refraction. That took me the best part of an evening to do as it requires pointing at a selection of stars all over the sky. By the way, it is perfectly feasible to use guided tracking with the DDM60.It all sounds complicated and the steep learning curve (for me, at least) isn't helped by the manual's general discoursive style. All the information is there but a check-list of steps to perform would have been useful. That said, the effort was totally worth it and I'm haven't had to retrain since my TEC 140 was delivered in the Spring. An observing session starts with me assembling the kit on the pier. The holes in the stainless steel plates were laser cut to a fine tolerance so once I power up all I have to do is tell the software to find the internal calibration marks on the high resolution encoders on each axis. That takes a few seconds and I then slew to a star. The star will generally only be a couple of minutes of arc away from where it should be (I take care to always take out any slack in the same way as I assemble the kit on the pier) and it is only the work of a few moments to "Sync" that error away. From the start of assembly to the start of the first sub can take less than 30 minutes although typically I perform the mechanical assembly earlier in the day if it isn't already set up. I don't get perfect tracking everywhere on the sky but at 1.9 arcseconds per pixel I can always get perfect stars at 200 second exposures and often get perfect stars at 1,000 second exposures!That accuracy isn't down to the torque motors, although their silent performance is very seductive, but owes more to the high resolution encoders on each axis and I think that is something we'll see more of in the future from all manufacturers. But however friendly the enveloping software and manuals are the performance is ultimately down to attention to detail of the end user in calibration. But "attention to detail" is the mantra of astrophotographers in any event... :)Hope that helps.Bob. Bob,Thanks for all the details. It is always good to get comments from people who have actually used the equipment and it looks as if the Paramount has some pretty serious competition.Nick. Interesting picture, Bob. The higher resolution image shows a number of artifacts in the arms and overall I found it on the overprocessed side. Possibly because of the processing most of the stars are utterly saturated and lost most if not all their colours (this might also due to the use of the h-alpha as (part of) a luminance layer). The D60 is an awesome piece of kit if it allows to do unguided shots this long!Thanks for sharingAndrea T.
Hi Andrea,Thanks for the feedback. I agree about the artefacts - I still have work to do to refine my skills in that area. Part of the problem is deciding what the viewing distance will be and maybe I'm being too optimistic in assuming that the image will be viewed at a comfortable distance in its entirety rather than at a scale where each pixel is easily resolvable to the viewer's eye. H-alpha wasn't used as a luminance layer so maybe it would be of interest if I briefly described the processing. First up here's a montage of some of the separate elements:[li][img size=1024]http://andersson-design.s3.amazonaws.com/astro/TEC/M31/M31_Montage.jpg[/... don't shoot luminance subs so I have yet to experiment with binning. I combine all my R, G and B subs to produce both a luminance image and a separate, and inevitably less deep, colour image. Apart from white balance and saturation tweaks that colour image is pretty much left alone and used as a "Color" layer in Photoshop. The luminance image for this shot was processed in PixInsight in a standard way with the extra step of creating a Star Mask to allow a spot of "HDRMultiscaleProcessing". The result was exported to Photoshop (16 bit TIFF is my preferred route) and then the stars were removed by a sequence of Dust & Scratches filter applications followed by a painstaking manual cleanup. I then subtracted the "No Stars" version from the original to produce a "Just Stars" version. The "Just Stars" version went back through PixInsight for a spot of deconvolution but I ended up applying virtually none as there weren't any bloated stars in this image. I often pass a "No Stars" image back through PixInsight as well but this time I saw no benefit and achieved a better result by using a combination of the "Astronomy Tools" contrast enhancement "Action" and Topaz Labs "InFocus" Photoshop plug-in to boost the micro-contrast.The star removal process was key to getting the Ha image into a usable form. As you can see, subtracting the "Green divided by 15" signal from the stacked Ha image got rid of a lot of the unwanted continuum signal in the disk but I was left with quite a number of star ghosts, not shown above and presumably from red supergiants local to our own galaxy. With those removed (I used a blink comparison method by toggling a temporarily added "Just Stars" layer - see the previous paragraph) you can see the result above. There is still quite an excess of an Ha signal from the central bulge. I could have just erased it but as it shows spiral structure I decided to leave it and, fortunately, my colour choice for the Ha component didn't upset the overall colour balance of the core when I added the Ha data as a Photoshop screen layer.The bottom right image is just a version of the originally posted image but without the Ha layer.So, returning to your comment about the lack of star colour. As mentioned above, apart from the separate H-alpha contribution the only colour in the image is due to a single "Color" layer in Photoshop. As a matter of personal preference I'm generally very unimpressed by images which show large numbers of brightly coloured stars as they look very unnatural to me. But I'll then immediately 'fess up and admit that my treatment of M31 is also unnatural as I've considerably compressed the dynamic range to display the outer disk without totally blowing the central bulge. Similarly, the micro-contrast to highlight the spiral structure is equally unnatural, not to mention the totally artificial rendition of the H-alpha intensity. I could certainly have made different choices, perhaps by applying the "Color" layer as two separate clipping masks to the "No Stars" and "Just Stars" components and changing the saturation for those two components separately. In the end I chose the simpler route and also went for a muted approach where I concentrated on getting the disk colour of M31 where I wanted it with the core hinting at yellowish and some blueish tints marking out the hot young stars in parts of the outer disk.I'm still very much a newbie at this sort of processing. So much to learn but in terms of a personal "house style" I'm getting close to where I want to be but I always value feedback such as your own to make me question my choices and, hopefully, do better in the future. :)Bob. Thanks for the exhaustive replay Bob,Well, all I can say is that my processing steps are much much simpler than the ones you describe and I got lost a little bit along the way. While eventually how much saturation should be applied is a matter of personal tastes (and I do subscribe to your view of some excessively garrish star colours in a significant amount of DS imagery nowadays) I find that your image shows a biased pinkish hue all over the central bulge and some very brightly coloured H-alfa regions all araund the disk. Contrast this with much more muted tones in most of the stars of our galaxy.Anyway, thanks again.Andrea T.
Hi folks,I reprocessed, starting from the original stacks. Here's the result and you can view the 4096 x 4096 pixel version here. [li] [/li]Bob. Hi folks,Reprocessed: here's M31 without additional Ha:[list] [/list]and with some Ha (Hydrogen alpha emission) blended in:[list] [/list]For your additional viewing pleasure I've made the 4096x4096 pixel versions available here and here respectively. All four images are copyrighted so please do not edit and/or repost without permission.This is old data from 2012 but it's taken me until now to successfully apply my natural colour workflow (description). The relative RGB values at each pixel have been preserved during stretching with the white balance for the entire image determined by M110. Whether that was a valid white balance choice is for wiser heads than mine. How much prominence to give the Ha data was a matter of personal preference: in the end I chose what I hope is a subtle blend which doesn't overpower the rest of the galaxy and limited the Ha to the spiral structure.I provided links to the full-sized versions not because they are pixel perfect but because they do offer an ability to see some of the hot blue stars associated with the structure of M31. I hope you enjoy the flight. 8)Bob.5 x 1000 seconds in each of R, G and B plus 10 x 1500 seconds Ha. TEC 140 plus ML16803. Awesome images. It really shows what can be done with good data and good technique.